(Phys.org)—A team of researchers with the University of Côte d’Azur in France has found that drops ejected by an oscillating surface can at times travel faster than the surface that ejected them. In their paper published in the journal Physical Review Letters, the team describes experiments they conducted by flinging water from a superhydrophobic surface and what they found. 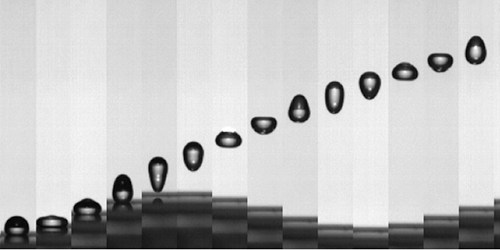 We investigate the behavior of droplets and soft elastic objects propelled with a catapult. Experiments show that the ejection velocity depends on both the projectile deformation and the catapult acceleration dynamics. With a subtle matching given by a peculiar value of the projectile/catapult frequency ratio, a 250% kinetic energy gain is obtained as compared to the propulsion of a rigid projectile with the same engine. This superpropulsion has strong potentialities: actuation of droplets, sorting of objects according to their elastic properties, and energy saving for propulsion engines.